" I know God will not give me anything I can't handle. I just wish that He didn't trust me so much. " Manuela is a very deep and profoundly caring person. 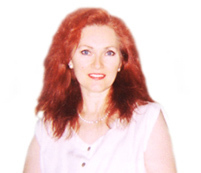 A gifted intuitive from birth, Manuela has been working professionally in the metaphysical and spiritual fields for over 27 years. She is uniquely skilled in several areas, being of great service to individuals everywhere. Intuitively, Manuela does not judge the information she receives from Spirit and her Spirit Guides. As such, Manuela is extremely accurate with her intuition. She will not violate the choices of another by freely passing along such information. Only through conscious permission and agreement will such information be offered. Manuela is gifted with such skills as clairvoyance, clairaudience, clairsentience, telepathy, in addition to her strong healing abilities. She has participated in conferences on Self-Hypnosis, Past-Life Therapy, Mysticism and Hands-on-Healing at the Institute for Research & Enlightenment (the Edgar Cayce Foundation), in Virginia Beach, Virginia. In Toronto, Canada, Manuela has been accredited with Usui Traditional Reiki I in 1990, following up with Usui Reiki II & III in Ottawa, Canada, certifying her as a Reiki Master and Teacher. Manuela has also attended the International Academy of Natural Health Sciences, completing courses on Huna Healing and Spectrum Therapy. Manuela's specialty is working on an individual's "Auric Field", also known as the "Human Energy Field", which is the vehicle through which we create our experience of reality, including health and illness. It is through this energy field that we have the power to heal ourselves. Manuela believes that in order for true healing to occur, one must go to the core issue of where the disharmony first originated, whether it be in this lifetime, or from past-life experiences. Once the information and understanding come to full consciousness to the individual, only then can true healing take place. "We create according to our beliefs"
Through her work, Manuela seeks to balance the physical, mental, emotional and etheric bodies to effect a harmonious healing of the whole person. As a Counselor and past-life regressionist, Manuela's abilities assist individuals in getting to the heart of the matter. This way, an individual can readily understand the nature of the current challenge and in essence, realize the situation may be sourced from another life experience, thus immediately alleviating their perceptions. The result is the individual is able to move forward in their life right away. Another gift, that of cross-dimensional communication, allows Manuela to communicate with souls that may be trapped or who are unwilling to leave their former corporeal domain, often referred to as hauntings. Manuela, through a high sense of awareness, reaches out and speaks directly with these soul energies, often discovering the reason for the haunting, possibly even the reason for their death. She discusses their situation with them and usually comes to an agreement whereby they continue on their journey into the light. Manuela is also gifted with remote sensing abilities. These finely-tuned skills allow Manuela to assist individuals with a healing, perform a soul rescue, and do an environmental energy cleanse. These skills are extremely valuable when individuals are not readily accessible, or require immediate assistance. Manuela is able to bend the rules of time and space, and effect significant results for individuals everywhere. Her clients are from all over the world, as "energy knows no boundaries". "Where attention goes... Energy flows"
"The best gifts I receive are when my clients share their stories of how my healing has helped them lead a pain- free and wholesome life once again", says Manuela. "Some may believe that intuition is only for enlightened beings, but in actuality it is a God given right which we ALL tap into every day of our lives." " Healing the Body and Mind with Spirit "
Privacy and Confidentiality Policy: Manuela realize's the importance of your privacy and confidentiality, and will not reveal your personal information to anyone else, under any circumstances. © MANUELA 1983-2010. All Rights Reserved.